On Saturday, 7th May 2016, from 10am to 8pm in the area of Cho Portada (parallel to the TF-1 highway), San Isidro is holding Expomotor 2016. 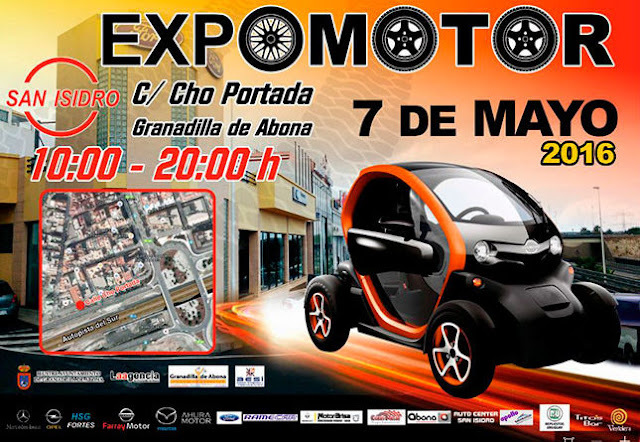 During the event, held as part of the Fiestas de San Isidro, Mercedes Benz, Opel, Nissan, Mazda, Ford, Renault and Dacia will present their latest sports, hybrid and electric models, offering attendees special offers throughout the day. The exhibition of new vehicles will be accompanied by that of used cars, classic cars and tuned vehicles, also present will be prestige cars such as the Ferrari Testarrosa, among others. Elsewhere, the Fiestas de Mayo 2016 de Los Realejos are still ongoing, including equestrian events from 9am on Saturday morning in La Cabezada (Icod el Alto); a Crafts Fair in the Avda. de Los Remedios from 10am on both Saturday, 7th May and Sunday, 8th May and a Canarian Folk Music Fiesta in the Plaza Viera y Clavijo from 1pm on Sunday, 8th May. 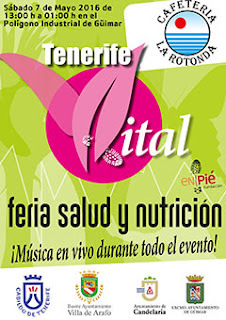 Meanwhile, from 1pm on Saturday, 7th May through to 1am the following morning, at the industrial estate of Güímar, there is the Feria Salud y Nutrición (Health and Nutrition Fair), with live music throughout. Around 30 stands will be offering orthopedics, orthodontics, physiotherapy, podiatry, acupuncture, aquatherapy, herbalists and natural and organic food, among others. 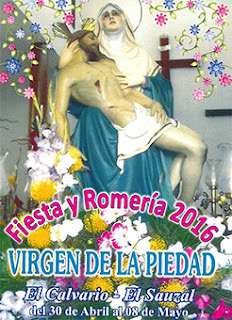 While the popular fiestas and romería in the district of El Calvario, in El Sauzal, in honour of the Virgen de La Piedad, offers a complete programme of recreational and religious activities. From 10pm this evening, Friday, 6th May, there's Karaoke; Saturday, 7th May from 7pm there's a Gran Paella in front of the church followed by dancing to the Malibú Band from 10pm and, on Sunday, 8th May, there are kid's activities with bouncy castles from 11am and the mass, procession and fireworks from 8pm. Met Office Aemet is forecasting some unsettled weather from this weekend. They’re not expecting a storm, but a depresssion approaching the Canaries from the west should bring some high winds and some rain, heavy at times, to the western islands from tomorrow.